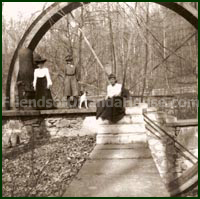 This incredible structure located at the base of the estate along the carriage path just off of Franklintown Road still stands to this day. The water wheel at one time pumped water from this location all the way to cisterns which were located in the attic of Orianda house so the house could have running water. Winans, for a man of his day, was an ingenious engineer. Sadly, in 1866, this water wheel was toppled by a flood. The only reliable account of this accident was published in the Gazette. Local groups are trying to figure out a way to protect and preserve what is left of this incredible water wheel. It might be one of the only ones remaining anywhere in this country. Over the years, vandals, trees, rust, and weather have taken their toll. If you have any interest in trying to help preserve this grand structure please contact the Friends of Gwynns Falls Leakin Park at their website.